New Delhi, Nov 2 (IANS) After "Chehre" -- an October exhibition showcasing select sculptures from the gallery's reserve collection, the National Gallery of Modern Art (NGMA) here on Friday inaugurated "Roopantar" -- an exhibition of more "rarely seen treasures" from its reserves. Spanning across diverse mediums and time frames, the exhibition shows individualistic work of masters like Ramkinkar Baij, M. Dharmani, Dhanraj Bhagat, Leela Mukherjee, C. Dakshinamoorthy, Balbir Singh Katt, as also one by Lalit Kala Akademi Chairperson Uttam Pacharne, among others. Curated by NGMA's in-house curatorial team, the the works of art selected for this exhibition vary in scale -- from the small to the very large, to gigantic -- and introduces the extraordinary repertoire that the gallery houses, NGMA Director Ritu Sharma said in a statement. The works "Horse Head" by Ramkinkar Baij, "Frustration" by M. Dharmani, "Chakraa" by Balbir Singh Katt, "Seed" by Nagji Patel, "Figure Lifting Foot" by Leela Mukherjee and "Putna Wadha" by Ishwar Chandra Gouta are some of the key works on view and are cast in different materials. "The exhibition explores legendary sculptors with varied subjects. 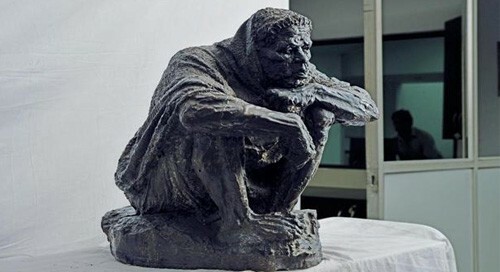 Society's varied aspects have been highlighted in a bronze and iron sculpture titled 'Accursed' by Kishore Thakur, 'Calling for Help' by Uttam Pacharne, 'Falling Nightmare Alone' by Ratnabali Kant, 'Trio' by Shankar Ghosh, 'Chasm' by Subhashini Puri, and 'Lust' by Ramesh Bist," NGMA Director-General and sculptor Adwaita Charan Garanayak said. Exhibiting the diversity in the modern and contemporary sculpture of India, the group show will continue in NGMA's Temporary Exhibition Gallery till a date to be decided later.